Lano is a member of the LAP (leucine-rich repeats and PDZ) family of proteins that also includes Densin-180, Erbin, and hScribble. The LAP family of proteins is involved in the regulation of cell adhesion, cell shape and polarity. The LAP proteins generally contain multiple leucine-rich repeat (LRR) domains which serve to target them to the basolateral membrane of epithelial cells. Lano is unique in that it alone does not possess one or more PDZ domains as do the other members of the LAP family. However, it can bind to the PDZ domain of Erbin in addition to those of membrane-associated and guanylate kinase (MAGUK) proteins which regulate adhesion and plasticity at cell junctions. It has been suggested that it is through these interaction that these LAP proteins participate in the maintenance of proper embryonic development and integrity of epithelial tissues. Figure 2. Formalin-Fixed Paraffin-Embedded (FFPE) on Placenta. Figure 1. 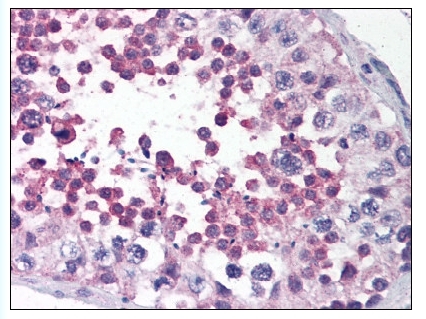 Formalin-Fixed Paraffin-Embedded (FFPE) on Testis. 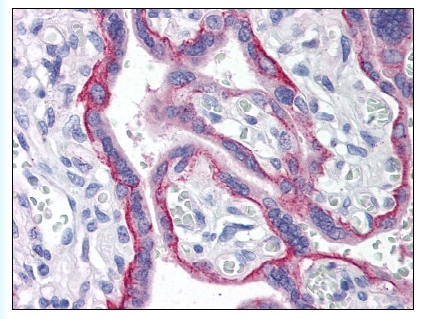 Immunohistochemistry of LRRC1 in human colon tissue with LRRC1 polyclonal antibody ( Cat # PAB12875 ) at 10 µg/ml. 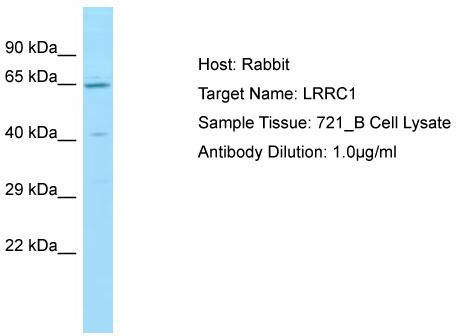 Western blot analysis of LRRC1 in PC-3 whole cell lysate with LRRC1 polyclonal antibody ( Cat # PAB12875 ) at 1 or 2 µg /ml. Western blot analysis of Lano in PC-3 whole cell lysate with Lano antibody at (A) 1 or (B) 2 ug /ml. 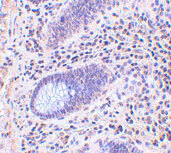 Immunohistochemistry of Lano in human colon tissue with Lano antibody at 10 ug/ml. Immunofluorescence of Lano in human colon tissue with Lano antibody at 20 ug/mL.